Police, fire and emergency management agencies that need a speedy vehicle for disaster recovery may want to consider the Gibbs Humdinga. Police, fire and emergency management agencies that need a speedy vehicle for disaster recovery may want to consider the Gibbs Humdinga from Gibbs Amphitrucks. 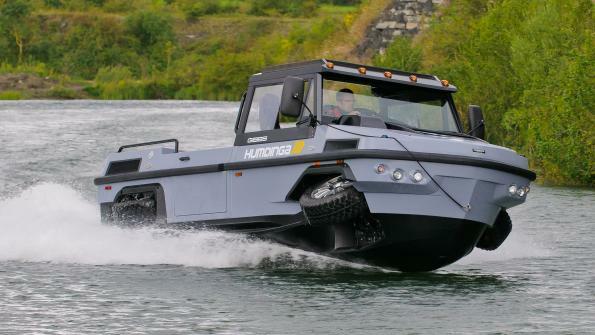 The Humdinga is a high-speed amphibian especially suited for disaster relief and use by emergency first-responders. Equipped with a turbocharged diesel engine, the emergency response unit is capable of reaching speeds in excess of 30 mph on water and highway speeds on land. According to Gibbs, it is the only truck in the world that can go faster than 9 mph on water. The Humdinga is designed to transition from land to water in seconds and is easy to configure for both cargo and passenger use. It incorporates patented vehicle-suspension, water-propulsion and wheel-retraction technology. Gibbs Amphibians has signed a licensing agreement with Singapore Technologies Kinetics Ltd. (ST Kinetics). The 12-year agreement between Gibbs and ST Kinetics includes non-exclusive production and sales rights for the Gibbs Humdinga. 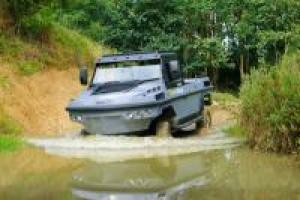 The agreement covers the manufacture and sale of high-speed amphibious trucks in S.E. Asia. Governments in the U.S. can purchase the vehicle either through Gibbs partnership with ST Kinetics or through Gibbs directly. Gibbs Chairman Neil Jenkins said the company’s partnership with ST Kinetics was the first of several licensing agreements for Amphitruck products and technology that Gibbs plans to sign in the next several years. Financial terms of the agreement with ST Kinetics were not disclosed. The Gibbs Humdinga is expected to strengthen ST Kinetics’ current offering of first-responder vehicles, including the ExtremV — an all-terrain vehicle designed for emergency rescues, medical evacuations and the transport of emergency supplies and personnel. An ST Kinetics spokesperson in Singapore said Humdinga’s ability to operate on both land and water will be useful in mitigating the devastating impact of tsunamis and other flood-related disasters. Commenting on his firm’s vehicle research and development efforts, Jenkins said: “We’ve spent more than 15 years and $200 million to create an entirely new form of transportation, removing the age-old boundaries between land and water. ST Kinetics has recognized the significance of this breakthrough technology and they’re poised to capitalize on the opportunity.” ST Kinetics is the land systems and specialty-vehicle arm of Singapore Technologies Engineering Ltd (ST Engineering). “Our partnership with ST Kinetics is another step forward in our plan to market high-speed amphibian vehicles of every imaginable size and capability throughout the world,” said Alan Gibbs, the company’s founder. Gibbs Amphibians is a developer of High Speed Amphibian (HSA) technology platforms for consumer, commercial, humanitarian and military applications. Gibbs Amphibians is a privately held company founded by Alan Gibbs with Neil Jenkins in 1999. It consists of two divisions — Gibbs Sports Amphibians, which designs and manufactures consumer sports amphibians such as the Quadski, and Gibbs Amphitrucks, which develops commercial amphibians for first responder, humanitarian and military use. Gibbs Sports Amphibians is based in Auburn Hills, Mich. and Gibbs Amphibians is based in Nuneaton, UK and Auckland, NZ. This video shows the versatile Gibbs Humdinga easily making its way on both land and water.